What Happens When a Juvenile is Referred to the WCJPD? How are juveniles referred to the WCJPD? When a juvenile is arrested for a class B misdemeanor or higher offense, the arresting agency refers the case to the WCJPD. The El Campo City Court, the Wharton City Court, and the Wharton County Justices of the Peace may also refer juveniles to the WCJPD. These lower courts may refer a child if he or she receives a third citation for a class C misdemeanor or if a child is referred to their court by his or her school for truancy for a third time. Also, these courts may refer a juvenile to the WCJPD for contempt of court if the child and/or responsible person(s) fail to obey orders of the court. WCJPD does not accept referrals from schools or parents. An officer of the WCJPD is contacted by a law-enforcement agency whenever a juvenile is taken into custody and arrested for a class B or class A misdemeanor or a felony offense. The juvenile probation officer determines, based on the information given by the law-enforcement agency, whether to have the juvenile transported to a juvenile detention facility or to have the juvenile released to a responsible person, such as a parent, guardian, or custodian. Juveniles may also be transported to a juvenile detention facility for violating an order of the court. Wharton County contracts with detention facilities in Ft. Bend County and Victoria County. 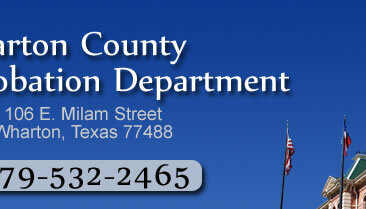 There is no detention facility located in Wharton County. Juveniles are placed in a detention facility when they pose a threat to others, the community, or themselves, or when no responsible person is available to supervise them. What happens when a juvenile is referred to WCJPD? If an arrested juvenile is released to a responsible person, the arresting agency gives the juvenile a copy of the Standing Order Regarding Juveniles Arrested for Delinquent Conduct. This order consists of terms and conditions by which the juvenile and responsible person(s) must abide until either the charge is dismissed or some form of disposition occurs. One of the conditions of the order requires that the juvenile and the responsible person(s) report to the WJCPD the first business day morning following the arrest. The responsible person will be required to fill out a personal information form. An assessment tool will be administered to the juvenile. One of the juvenile probation officers will go over the terms and conditions of the order to ensure everyone understands what is required. A financial report form will be given to the responsible person to be completed and returned at the next meeting. Once the arresting agency submits the offense report to the WCJPD, the case is read to determine if it meets the criteria of a referral to the department. Once the referral is accepted, a juvenile probation officer is assigned, and an intake conference is scheduled with the family. Documents or other written information about the juvenile’s family receiving state’s assistance, Medicaid, AFDC, food stamps, etc. The responsible person(s) driver’s license, state ID card, work visa, and social security card. Copies of the personal documents will be made at the time of the intake conference and the originals will be immediately returned to the responsible person(s). The juvenile probation officer will get to know the juvenile and his or her family situation during the intake conference. The responsible person(s) will sign release forms allowing the officer to obtain records needed in the investigation of the needs of the juvenile. In addition, one or two assessment tools will be administered to the juvenile. Once the investigation is complete, the officer will be able to make an informed recommendation for the juvenile’s supervision to the court. A letter will be sent to the juvenile’s responsible person(s) requiring the presence of the juvenile and the responsible person(s) at a hearing in the 329th District Court, acting as the Wharton County Juvenile Court, which is located at 100 South Fulton Street in the City of Wharton. The Burleson Street entrance must be used by the public. Sleeveless shirts, shorts and/or shirts with ethnic, racial, or sexual phrases are not permitted to be worn inside the courtroom. All headwear must be removed unless it is for religious purposes. Disruptive children are not permitted within the courtroom. During the hearing, the charge(s) against the juvenile will be read and the family will be asked if they can afford to hire an attorney. ALL juveniles must be represented by an attorney. An attorney will be appointed if the family cannot afford one. The family will be told when to return to court. A summons to appear will be served if the family does not appear for the hearing as requested. Should the family still fail to appear for the hearing after being summoned, a warrant for failure to appear will be issued for the responsible person(s). Deferred prosecution is an agreement between the juvenile, the responsible person(s), and the court. If the juvenile and responsible person(s) follow the terms and conditions of the agreement for the set period of time, which is usually three to six months, the case(s) against the juvenile will be dismissed. The juvenile and responsible person(s) are required to return to court if the terms and conditions of deferred prosecution are violated. 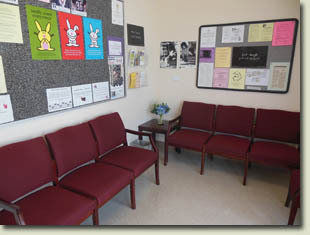 In a court proceeding called an adjudication hearing, the juvenile accused of the crime, the juvenile’s responsible person(s), and the juvenile’s attorney appear before a judge or jury that will decide if the juvenile committed a delinquent act or conduct indicating a need for supervision (CINS). Court-ordered probation is the most common dispostion if the juvenile is adjudicated. The juvenile and the responsible person(s) are ordered by the court to obey certain terms and conditions of supervision. If the juvenile violates those terms and conditions, he or she may be sent to a detention facility and/or additional court action may be taken. The responsible person(s) may also be taken to court for failing to obey the terms and conditions of probation. A juvenile may be ordered by the court to a juvenile placement facility. It is preferred by the WCJPD and the Wharton County Juvenile Court to keep juveniles in their homes whenever possible. However, treatment needs or persistent failure to obey the orders of the court sometimes result in placement. The average length of time that a juvenile stays in a placement facility is six months, however, it may be more or less time depending on the needs of the juvenile and how well the juvenile responds to the program. 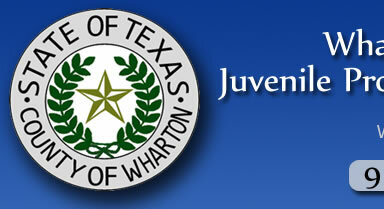 It is very rare for a juvenile to be referred to a facility of the Texas Juvenile Justice Department (TJJD) by the Wharton County Juvenile Court. Only felony offenders are eligible for a TJJD referral. Every other avenue of supervision and treatment is explored before referring a juvenile to TJJD.